To link a User Story to an Epic, you must access the Epic’s details page – for details about accessing the details page, you can go to How to manage an Epic. In the Related user stories section, click . This action opens the Create a relationship with form – perform the steps that follow on this form. 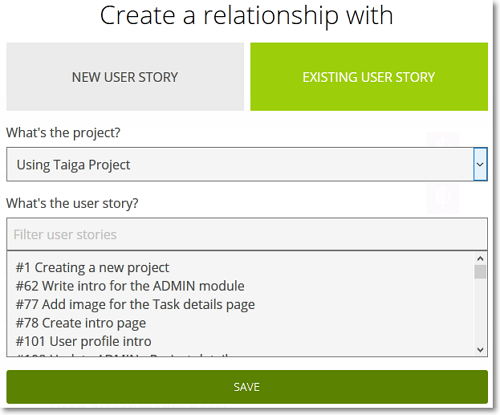 you can link existing User Stories – for more details, you can go to: Link existing User Stories. Note: To close the form without linking any User Stories, in the top-right corner of the page, click or press ESC on your keyboard. Go to the details page of the Epic. In the Related user stories section of the page, position your pointer over the row of the User Story you want to “unlink”. On the right side of the User Story’s Subject, click and then confirm your action. Click the What’s the project? 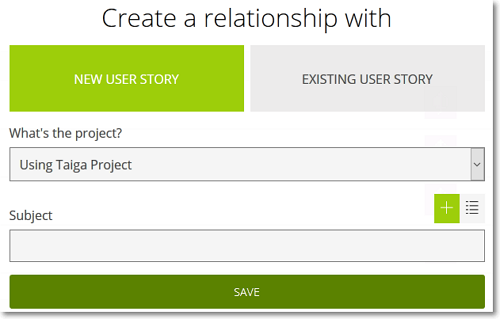 box and select the project on which you want to create the new User Stories you want to link to the Epic. User Stories in bulk – click and then enter the Subjects of the new User Stories, one per line. Click the What’s the project? box and select the project from which you want to link the User Stories to the Epic. In the What’s the user story? box enter the Subject of the User Story you want to link and then select that User Story on the list below the box.